No, not mine. 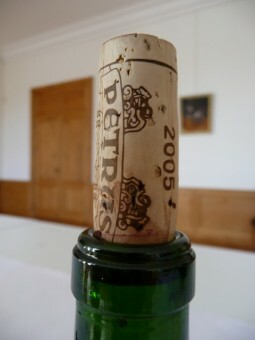 I thought for my first blog post, I should start at the top: the wine in question is Pétrus 2005. 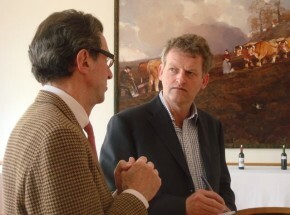 He told me that Pétrus shouldn’t be thought of as being one of the most expensive wines on the planet, but as the best value wine in the world. ‘You only have to own it for a short time and it goes up in value’. Frédéric Lospied, who looks after export sales for Mouiex, thinks the price is ‘indecent’, but I guess a wine is worth what someone will pay for it. When I tasted the other Moueix wines in bottle last autumn – La Fleur-Pétrus, Trotanoy and so on – Frédéric explained that he couldn’t open the Pétrus because it didn’t have a label on, and would I mind coming back (label? who needs a label?). He told me that they only open three bottles a year from a vintage like this, so I wasn’t going to say no. I cannot comment on the whether the wine is worth the money being asked today, but the bottled wine certainly lives up to my expectations from that first barrel sample. In a brief note for Wine & Spirit in the May 2006 issue, in my selection of the Top 100 wines from the great 2005 vintage, I rated it 96-100 points. “2005 reminded Christian Mouiex of the 1982 vintage, only now they are better equipped to handle the vines to achieve ‘perfect ripeness'”, I wrote. “This phenomenal wine will only be available to those who already have a prior reservation. Drink 2015-2040”. Tasted from bottle, the wine has taken on weight from the barrel ageing and the colour is extraordinary. I haven’t seen a wine this colour before: it is a deep, dark, perfect blood red. The texture too is remarkable – it is very rich and velvety but not at all heavy or viscous. On the palate, there is unbelievable complexity and wave after wave of brambly blackberry and redcurrant fruit – and yet it feels that there is so much more in reserve. It has an ethereal quality that I have only tasted in wines from the plateau of Pomerol, and even then it has a beguiling character that’s quite different from Lafleur, L’Evangile, VCC and others. More like Le Pin – and both are almost all merlot. Behind the hedonistic appeal is a stream of persistent but superfine tannins. The finish is long. Very long. 60 seconds? It is a perfect expression of merlot from this unique plot on the plateau of Pomerol. For me, this wine merits a perfect 100 point rating and is one of the greatest wines I am ever likely to taste. I felt quite guilty, not because of the price or the fact that I am so privileged to taste it from bottle, but this wine should be left for 20 years or more for it to be at its peak. Infanticide. I have a horrible sense that few bottles will survive that long, which means that it might even be a reasonable investment at today’s price. I was not surprised to see James Suckling of the Wine Spectator subsequently rate the wine 100 points but I was quite shocked that Robert Parker, the world’s most influential critic, only gave it 96+ points. Maybe that bottle didn’t have a label.